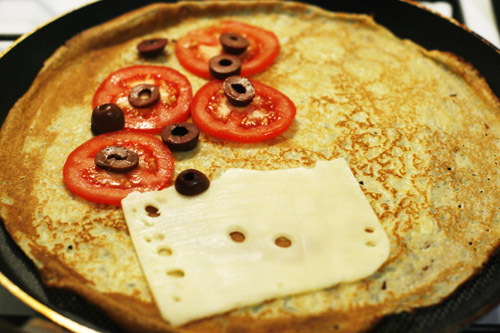 It came with a whole lot of superstitions to ensure good wealth for peasants in the olden days, such as: on Chandeleur Day, crêpes have to be made to avoid the upcoming wheat crops to be damaged. One also had to flip a crêpe with the right hand while holding a golden coin with the left, then rolling the coin in the crêpe and leave it at the top of the cupboard for a year, after which you would retrieve the coin from the crêpe fragments to give it to a poor person. These days, I don’t think many people care much about the religious significance of the Chandeleur. To everyone, it’s an occasion to gather with friends and family, eat way too many crêpes and flip them in the air with the pan, to the kids’ greatest delight! Since people celebrate Christmas in July here, I decided to do Chandeleur in June (even though it should be in September if I was to do it correctly, but then I’m sure no one will hold it against me). I have gathered some friends at home, after spending a few hours preparing the batter and cooking them as follows. First the flour: I use about 1kg because I want to make A LOT of crêpes (about 50). 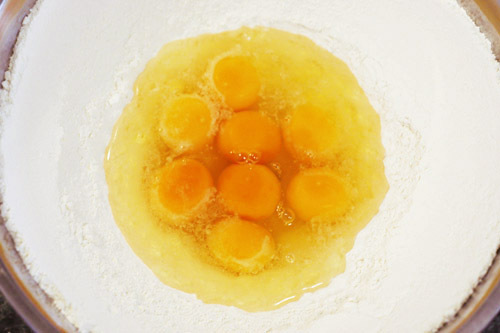 I break 9 eggs in the little well I created at the centre of the flour. 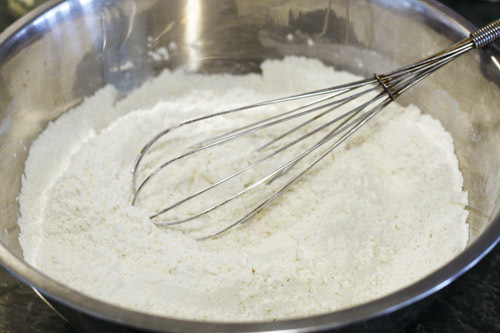 I start whipping the eggs with the flour until it gets really too hard! 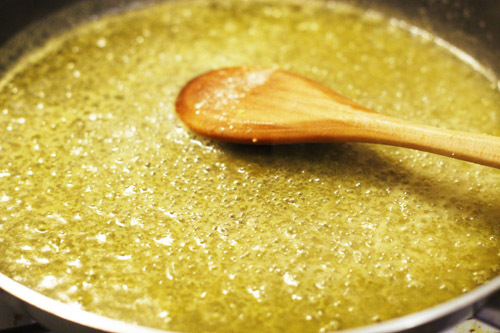 As I will use the batter for both sweet and savoury crepes I don’t add sugar, only a pinch of salt and a table spoon of sunflower or grapeseed oil. 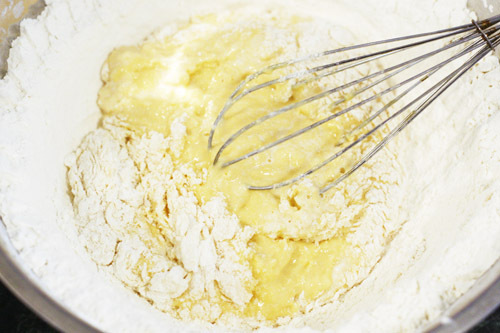 A little tip: a nice drop of beer (around 100ml) in the batter will make it lighter and it’s also quite fun to watch the reaction in the batter! I let it rest for an hour before starting to churn out most of the crêpes before the guests arrive, so I can still talk to them a bit (the main problem with crêpes being that you spend your time at the stove, so try to make the most of it in advance, keeping your main stack of crêpes in the oven covered with foil ). 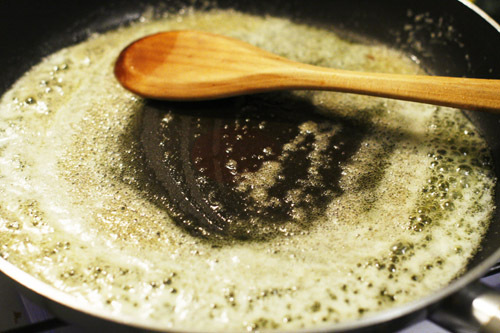 I grease the pan with oil and keep by my side a little dish of oil with a scrunched-up paper towel, which I use to re-grease the pan regularly. 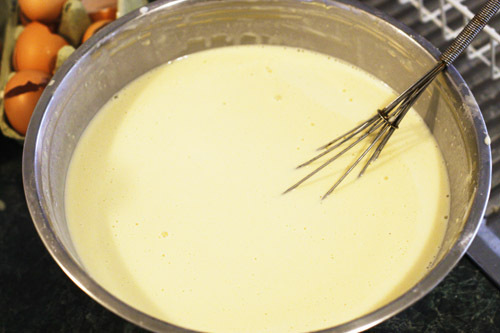 Once you pour the batter in the pan with the ladle, the success of the crêpe resides in a nice rotative wrist move to help it cover the pan surface totally and evenly. I still find it not that easy these days and sometimes have to fill out the gaps with a spoonful of “band-aid” batter. Once that’s done, I wait until the edges of the crepe start curling and getting golden and crisp to turn it over with a spatula. After a few trial crêpes (the first one is never good), I do a few flips in the air, which is always very rewarding! When I see that the level of batter has well diminished, I start doing the savouries, as they are served first. I place the garnish on the crêpe after flipping it, leave it a minute or two for the cheese to melt, then fold them into quarters. Here are only a few examples of my favourites, but really the possibilities are limitless! The Caramelised Apples Crêpe (this one inspired by Baroque Bistro) turned out well, even though we should have cut the apples into smaller pieces for a softer consistency. 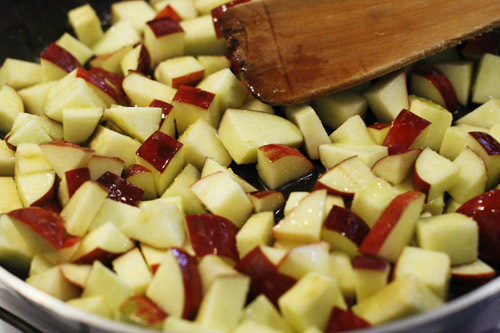 M. mixed the apples with cinnamon and brown sugar before caramelizing them in the pan and serving them with a dollop of cream… a keeper! The Crêpe Suzette turned out better than I hoped, considering it was a first attempt! 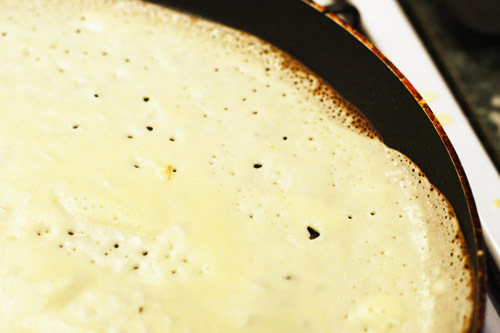 .. and the folded crêpes placed onto the pan. I pour some Grand Marnier and “flambé” it: et voilà! 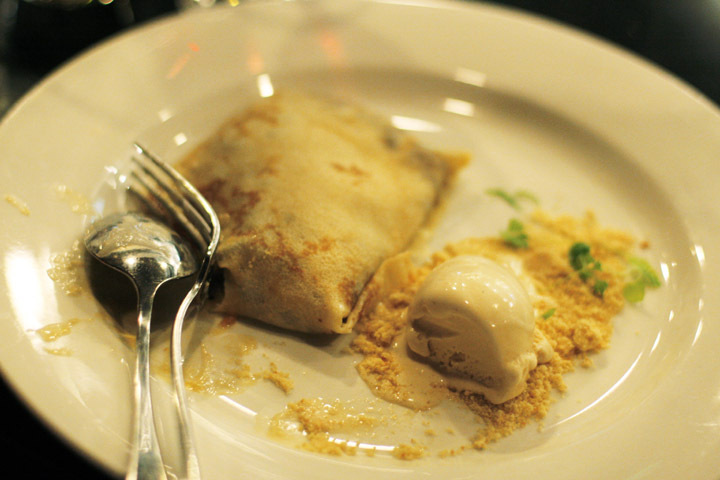 This crêpe combination attracted the most compliments from the guests, a real crowd pleaser! I usually make sure I make too many to have some for breakfast the next day, but that night there were none left, damn it! 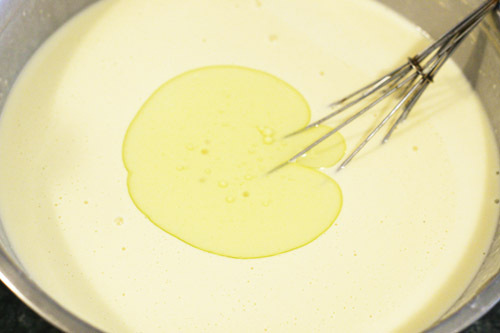 Nevermind, I made a whole new batch the next day just for the two of us… vive les crêpes! 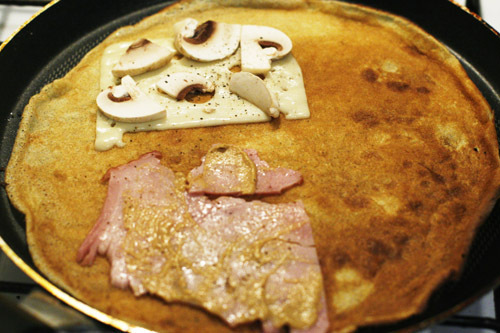 This entry was posted in Recipes and tagged Chandeleur, Crêpes, Crêpes Suzette. Bookmark the permalink. Omg, you are crêpe queen. i’m envious of your skills. 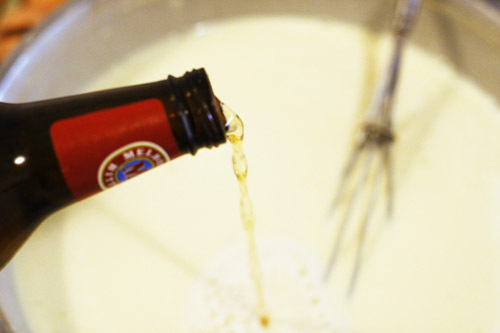 i never thought to put beer into crêpe mixture. dude i freaking love crepes! 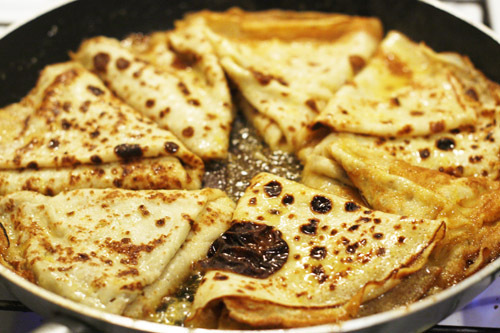 cant wait till the weekend to make a huge pile o crepes! How do you manage to keep your slim figure ?You seem to eat lots of nice good dishes !! depuis quand L’Australie fête Noël au mois de juillet ? But why not, it’s winter after all !! I think every day should be crepe day! If only I had enough time in the morning to make them 😦 Yours look amazing and im definitely trying your trick with the beer. Great work! @Katie: You can make them the night before and heat them up in the morning if time-poor, they will still be pretty damn good! oh my goodness. I’d kill someone to eat the crepes in the last pic!